Smiles in Belgium Once More, this Norman Rockwell painting, appeared on the cover of The Literary Digest published April 19, 1919. An alternate title for this work is Soldiers with Belgian Children. 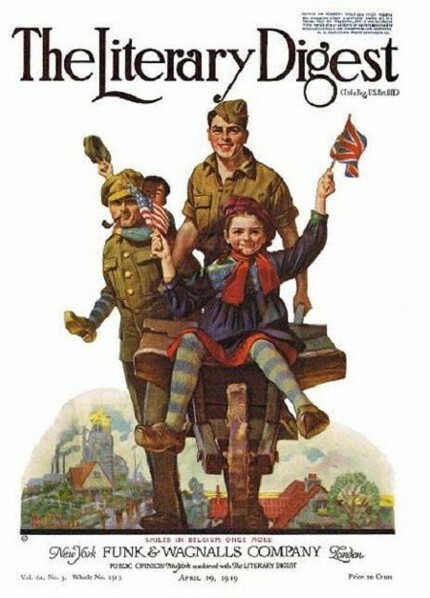 This illustration is one of eight Rockwell paintings The Digest featured on its cover in just 1919 alone. This painting was also Rockwell's sixth overall out of 47 total pictures featured on the cover of The Literary Digest. Rockwell's career with the Literary Digest only spanned five years, from his first cover illustration, Boy Showing Off Badges in 1918 to his last, The Night Before Christmas, in 1923. The original oil on canvas painting, 30 x 28.125 inches or 76 x 71.5 cm, is part of the collection of the Wagnall's Memorial Foundation Museum. This painting was also been reproduced in Norman Rockwell, A Definitive Catalogue by Laurie Norton Moffatt on page 49. Smiles in Belgium Once More was only one of 47 Norman Rockwell Literary Digest covers; here is the list of more Norman Rockwell Literary Digest scans.